Igneous rocks are rocks that are formed from melted rocks1. Igneous rocks are one of the three main classes of rocks. The others being sedimentary and metamorphic rocks. Igneous rocks from left to right: gabbro, andesite, pegmatite, basalt, pumice, porphyry, obsidian, granite, and tuff. Molten rock material below the surface is called magma. Magma that has reached the surface is lava. Igneous rocks that solidified within the crust are plutonic (or intrusive) rocks. Those igneous rocks that solidified at or very near to the surface are volcanic rocks. If volcanic rocks form as a result of explosive volcanic eruptions, fragmental rocks known as pyroclastic rocks form. Non-explosive or less explosive eruptions result in lava flows, which form lava rocks when solidified. Igneous rocks are mostly classified on the basis of their composition (either mineralogical or chemical), but there are a number of exceptions where classification is based on texture. Plutonic rocks (coarse-grained igneous rocks that solidified in the crust) are usually classified according to their mineralogical composition. Most important minerals upon which these classification schemes are based on are quartz, feldspars, pyroxene, olivine, hornblende, and feldspathoids. The classification of most plutonic rocks is based on the QAPF diagram. Mafic and ultramafic plutonic rocks have their own classification diagrams because quartz and feldspars (cornerstones of the QAPF classification) are missing in these rocks. Pegmatite is a notable exception. Most pegmatites have a granitic composition, but the defining parameter is the grain size: pegmatites are exceptionally coarse-grained plutonic rocks. 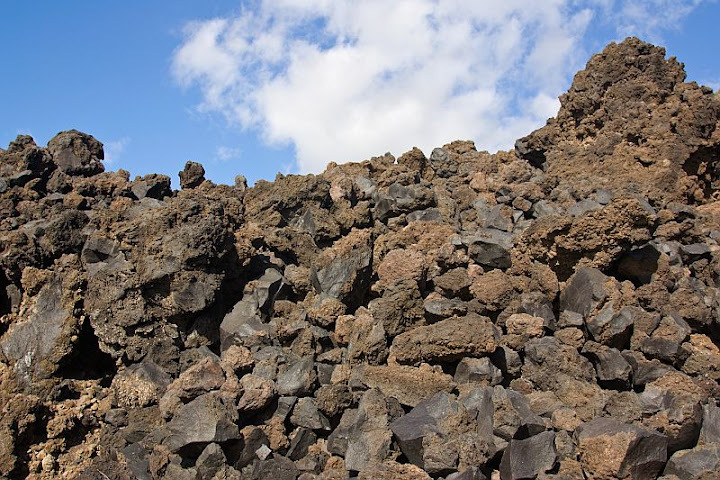 Volcanic lava rocks are classified according to their chemistry because they are too fine-grained to make mineralogical classification practical and they often contain glass (rock material without crystalline structure) which further complicates the situation. 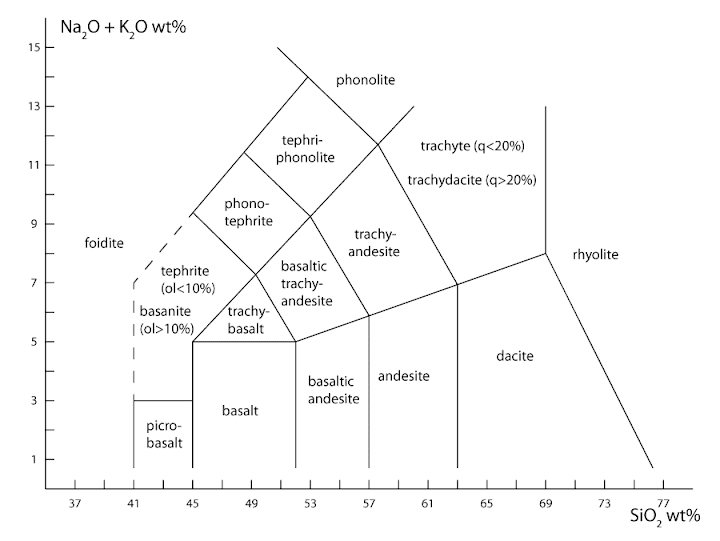 Volcanic rock types like basalt, andesite, and phonolite have a strictly defined boundaries on the TAS diagram which is used to classify volcanic rocks. Fragmental volcanic rocks are known as pyroclastic rocks. They are composed of material (ash, lapilli, bombs, blocks) that were thrown out of volcanic vents during violent explosive eruptions. They have their own classification principles which are based on the average grain size and relative proportions of the constituents. QAPF diagram for plutonic rocks is a double ternary plot. Q, A, P, and F correspond to quartz, alkali feldspar, plagioclase, and feldspathoids, respectively. Note that quartz and feldspathoids are mutually exclusive. One rock sample is not allowed to contain both of them. This is no arbitrary rule. These minerals indeed do not co-exist in one rock sample for chemical reasons. 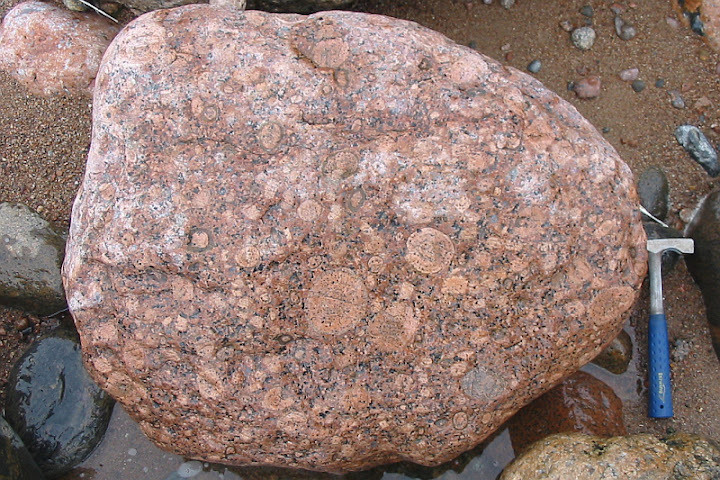 Feldspathoid-bearing rocks are relatively rare. Rocks that contain abundant quartz and feldspar are much more common. The most well-known example is granite. Monzonite is a plutonic rock that is somewhat similar to granite, but it contains less quartz and more plagioclase than granite does (monzonite is in the middle on the QAPF diagram). Plutonic rocks are coarse-grained or at least visibly crystalline because they solidified deep underground where crystallization process was slow. The sample is from La Palma, Canary Islands. La Palma is a volcanic island, but some plutonic rocks like monzonite and gabbro crop out in small erosional windows. Width of sample is 6 cm. TAS diagram for volcanic rocks. This is purely chemical classification. It can be applied if the chemical composition of a rock sample is known. However, rock types shown above also have characteristic mineral assemblages and typical appearances which helps to give them provisional field names. These often turn out to be not entirely correct, but basalt is usually easily distinguishable from rhyolite, for example. 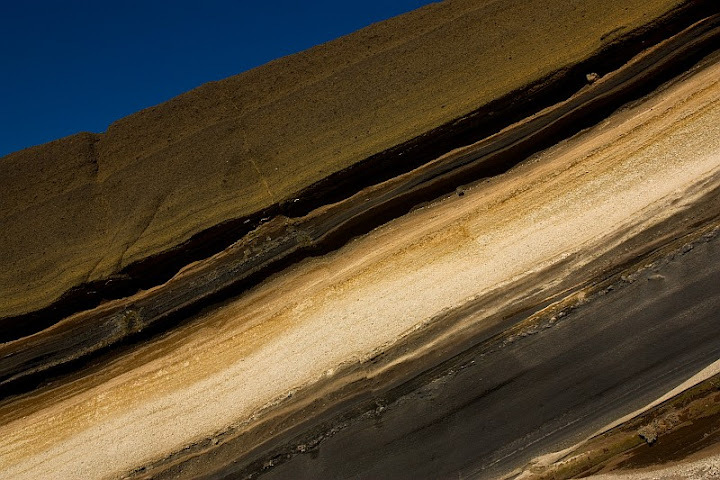 As a general rule, rock types on the left tend to be darker and those on the right lighter in both color and weight. Rhyolite porphyry from Scotland with K-feldspar and quartz phenocrysts. Rhyolite is a volcanic rock with a granitic composition. 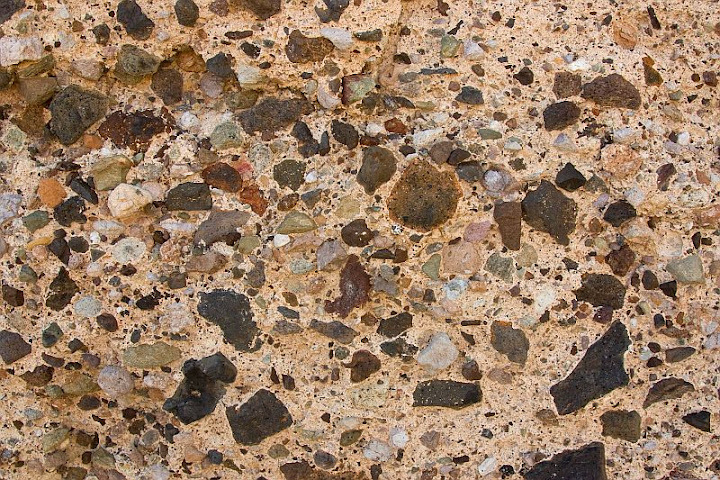 Volcanic rocks are fine-grained (individual crystals are not visible to the unaided eye), but they frequently contain larger crystals (phenocrysts) embedded in fine-grained groundmass. These phenocrysts formed before tha magma was expelled from the volcanic vent. Width of sample 8 cm. Classification of pyroclastic rocks resembles classification principles of clastic sedimentary rocks. Ash is a volcanic analogue of sand. Lapilli corresponds to gravel and blocks and bombs are volcanic equivalents of boulders. 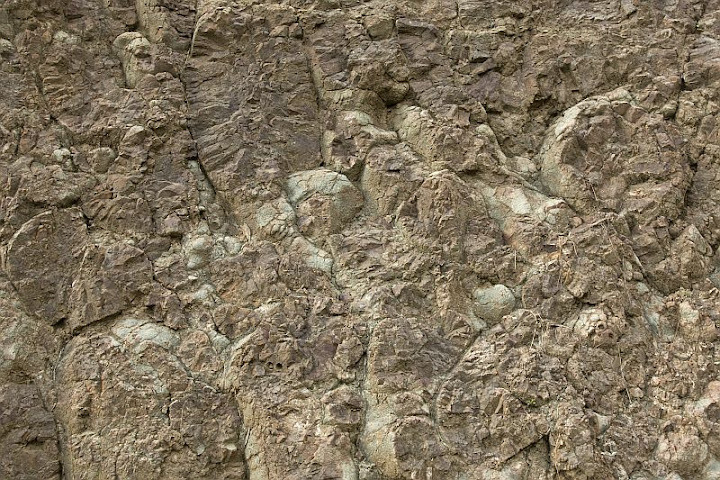 The most important pyroclastic rock type is tuff (lithified volcanic ash, analogous to sandstone). These three diagrams are based on classification principles defined by the International Union of Geological Sciences Subcommission on the Systematics of Igneous Rocks2. 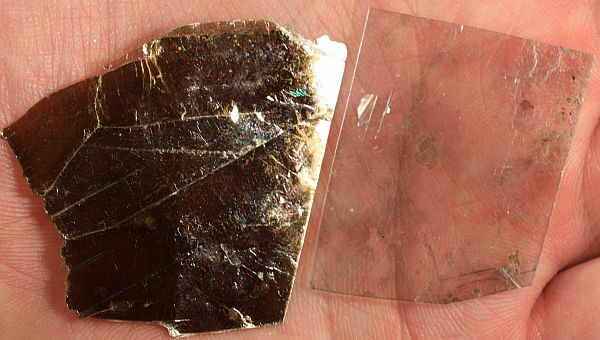 Obsidian is composed almost entirely of glass. Hence, it has no mineralogical composition. Chemical composition can be determined, but the most striking and obvious feature of obsidian is its glassy nature. All such rocks regardless of their chemistry are therefore called obsidian or volcanic glass. Obsidian is usually lava rock, but some pyroclasts also have a glassy texture. There are glassy sand grains from Hawaii on the picture above. These small pieces of obsidian possess a basaltic composition. In majority of cases obsidian has a felsic composition. Width of view is 20 mm. Diabase is another example of a rock type that dares to challenge our classification schemes. It is compositionally equal to basalt and gabbro but texturally somewhere between them. Such rocks mostly formed in the crust but at relatively shallow levels close to the surface. Diabase and other such rocks are sometimes called hypabyssal rocks although this term seems to be somewhat old-fashioned nowadays. White crystals are plagioclase phenocrysts. 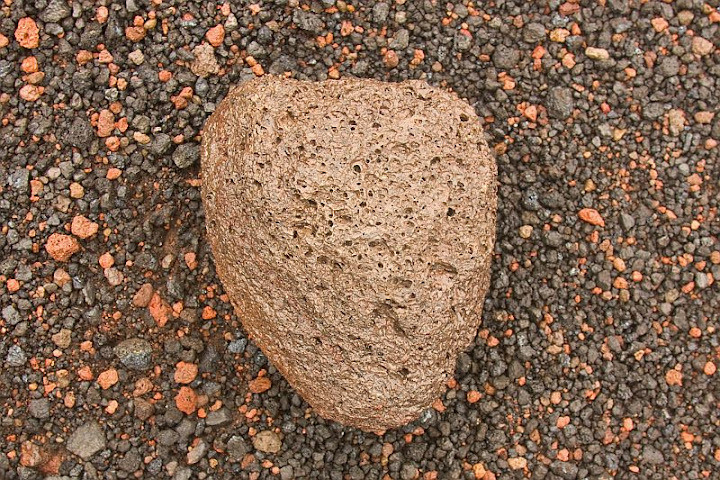 The rock sample is from La Palma, Canary Islands. Width of sample is 5 cm. Scoria is a highly vesicular volcanic rock. It usually has a basaltic composition, but this is not a defining parameter. It just has to be very porous. Tenerife, Canary Islands. Width of sample is 7 cm. Carbonatite is a real stranger in the igneous world. It can be volcanic or plutonic, but the most striking thing is its composition. Unlike other igneous rocks which are mostly composed of silicate minerals, this one is compositionally close to limestone and marble, hence the name which refers to its carbonate composition. Such exotic igneous rocks have their very own classification principles. They are better kept separately from the rest or we risk to ruin our illusion that we understand something. Carbonatites are indeed still mysterious rocks. They are uncommon, but still occur frequently enough that ignoring is not an option. Carbonatite is not the only exotic igneous rock type. Such exotic rocks like lamproites, kimberlites, lamprophyres, etc. are for various reasons treated separately just like carbonatites. However, they are all volumetrically insignificant. They can be safely ignored if one just wishes to obtain a general overview of igneous rocks. The sample is from Germany. The range of chemical compositions of igneous rocks reflects the average bulk composition of the crust. The most important chemical elements are oxygen and silicon. 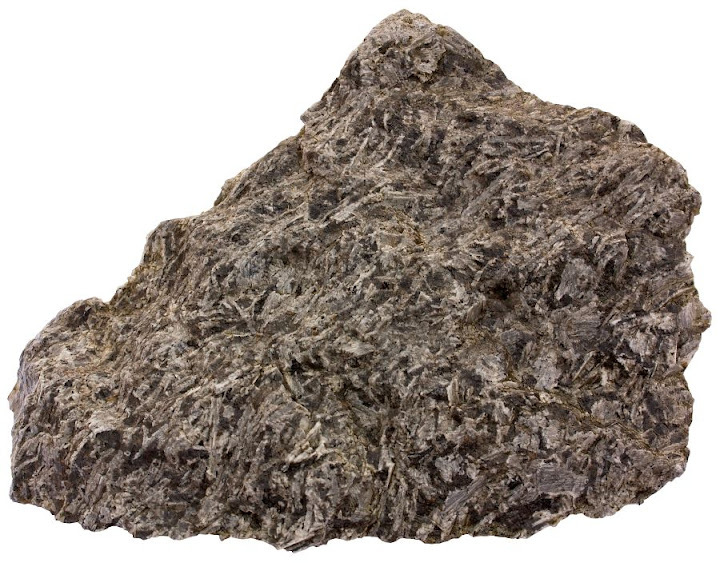 Common igneous rocks comprise 40…77% of silica (SiO2). Other important oxides are alumina (Al2O3), magnesia (MgO), lime (CaO), soda (Na2O), and potash (K2O). Numbers given in the table above are weight percents. 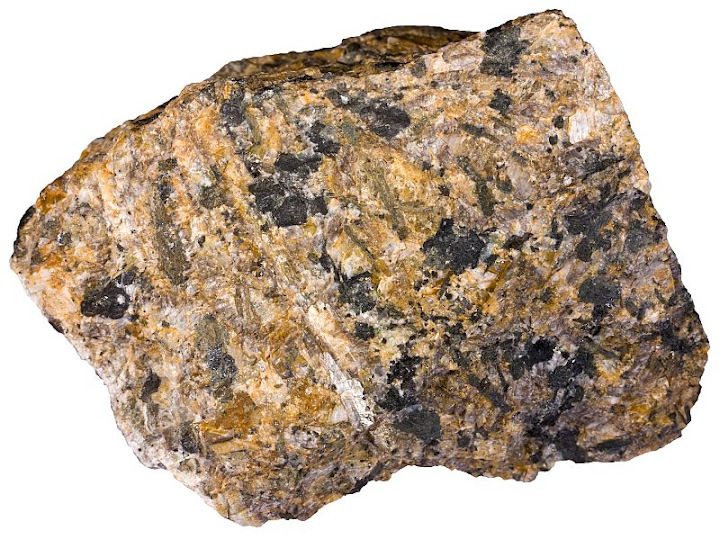 Granite contains much more silicon and potassium than basalt does. Basalt is richer in iron, titanium and magnesium. 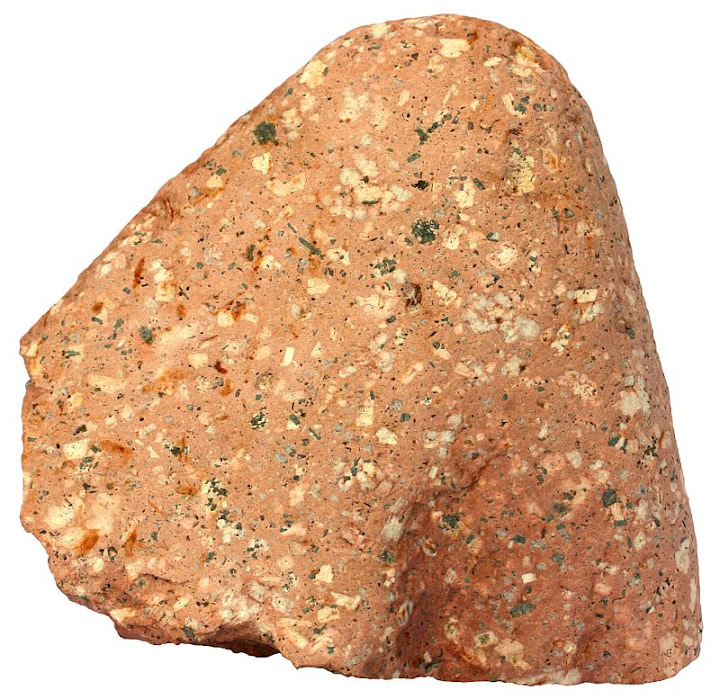 Real igneous rocks do not generally contain these chemical compounds (potash, lime, etc.). This is just a historical way to express the chemical composition of igneous rocks. We still do it that way although it has little logical justification anymore. In reality, igneous rocks are largely composed of minerals. Silica indeed occurs as a mineral quartz, but there are no magnesia or potash. 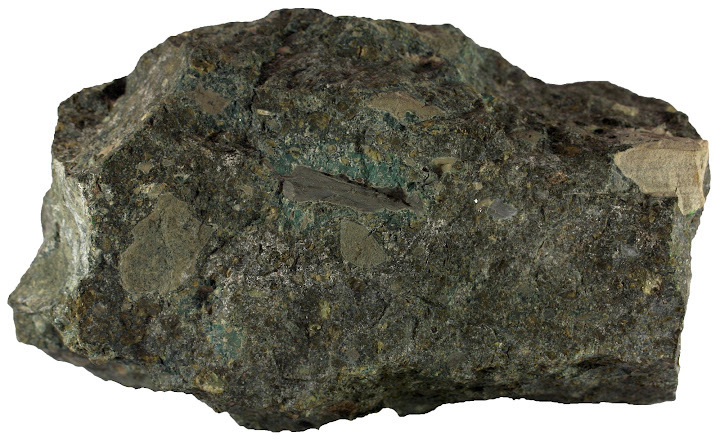 Common Mg-bearing minerals in mafic igneous rocks are olivine and pyroxenes. Most important potassium-bearing minerals are K-feldspar and micas. The chemical composition of rocks determines its mineralogical composition because the chemical elements are the building blocks of minerals. 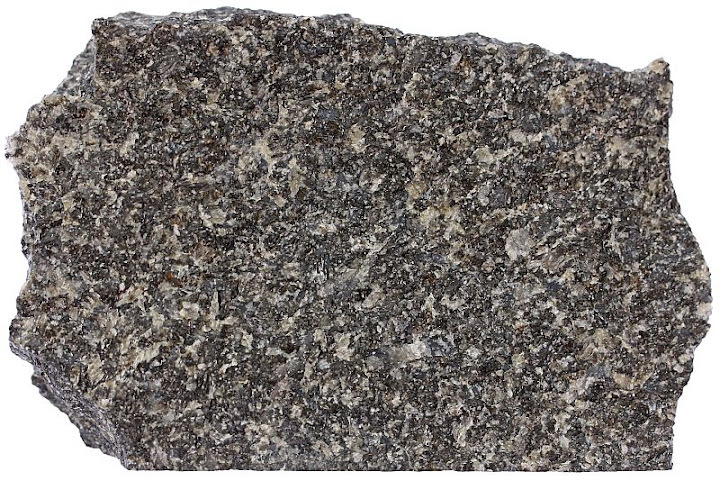 Granite is largely composed of quartz and K-feldspar because it contains so much silicon and potassium. Basalt contains lots of iron and magnesium which are used to make pyroxenes and olivine. Basalt contains much more calcium than granite does. Hence, dominant feldspar in basalt is Ca-bearing plagioclase, not K-bearing K-feldspar. Igneous rocks also contain a number of less important or volumetrically less significant minerals which use up chemical components that are present in smaller quantities. Common accessory minerals in igneous rocks are apatite, titanite, magnetite, ilmenite, zircon, tourmaline, beryl, epidote, rutile, allanite, garnet, chromite, spinel, monazite, etc4. Quartz (W), muscovite mica (N), plagioclase (O), and microcline (S) are all very common minerals in igneous rocks. These crystals are unusually large for a normal igneous rock (each one roughly 10 cm across). They are from a pegmatitic granite. Evje, Norway. 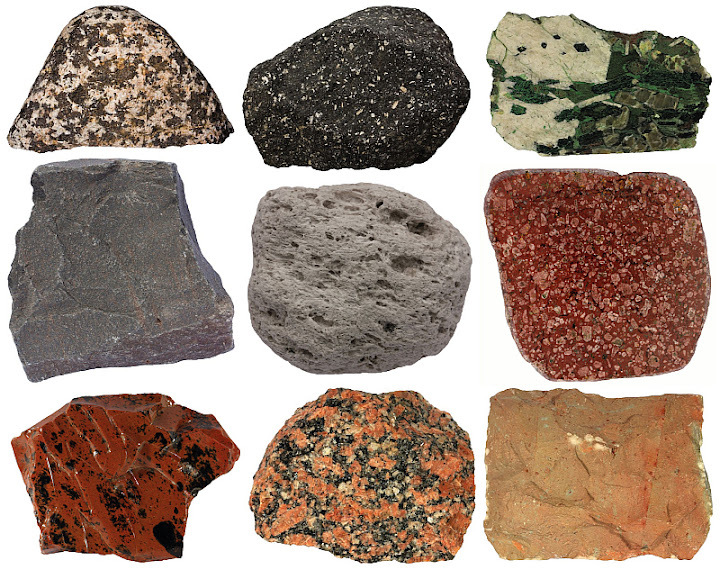 Many other examples below are also from pegmatitic rocks. I use them because their constituent minerals are large enough to be seen easily. 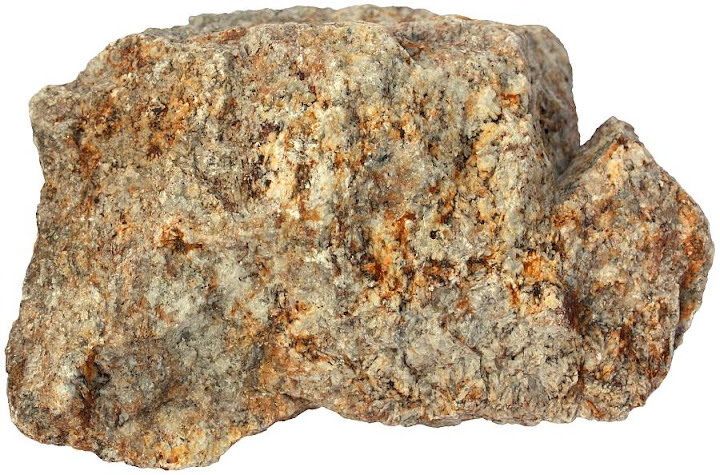 This rock sample demonstrates that pegmatite does not need to be granitic in composition. Here is an example of pegmatitic gabbro which is composed of light-colored plagioclase and dark-colored pyroxene augite. Both plagioclase and pyroxenes are very common minerals in the crust. They are especially common in basaltic rocks. Olivine is an important green mineral in mafic and ultramafic igneous rocks. Here is a sample of picrite from La Palma, Canary Islands. Width of sample is 5 cm. Micas are important minerals in many igneous rocks, especially in those that have a felsic composition. They are easy to identify because of their characteristic appearance. Two of the most common mica minerals are brown biotite and greenish gray muscovite. Feldspathoid-bearing igneous rocks occupy the lower triangle of the QAPF diagram. The most important feldspathoid mineral is nepheline. Rock sample above is nepheline syenite (foyaite). Gray is alkali feldspar, nepheline is darker gray. Width of sample is 16 cm. Igneous rock are formed from melted rocks. Hence, we first have to melt something. Here is an example of this process which is known as anatexis — partial melting of pre-existing rocks. Rocks that melt do so partially because their constituent minerals have different melting temperatures. Hence, source rocks and molten matrials extracted from them have different compositions. In this case you can see a light-colored melt and a dark-colored metamorphic residue. Picture taken in Western Norway. Rock that has formed that way is known as migmatite. Width of view is over one meter. Intrusive rock granite on the western coast of Ireland. I have also written about the biogenic white sand covering the beach there. Boulder on a beach on the NE coast of the Gulf of Finland in Karelia. This boulder comes from the Vyborg batholith that is largely composed of rapakivi granite. Igneous rocks may form beautiful columns like these columns of the Giant’s Causeway on the northern coast of Northern Ireland. Columns form as cooling magma or lava contracts. Volcanic vents are fed with molten material by tabular sheets of magma which are known as dikes. 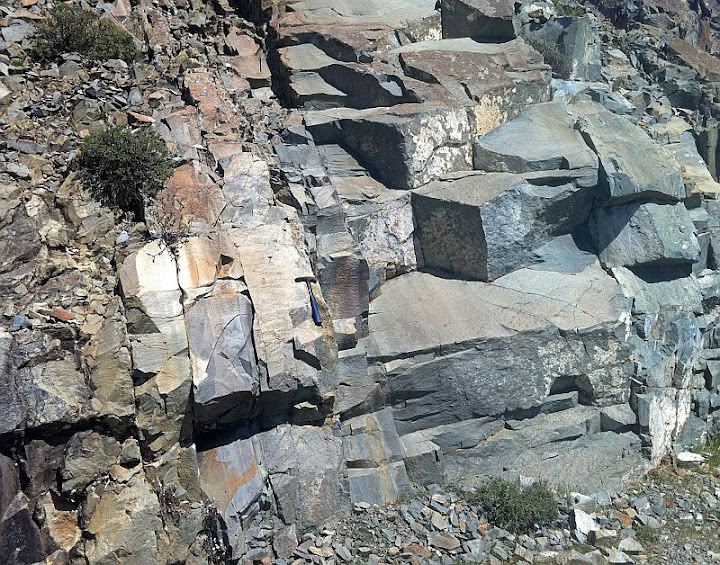 Here is an outcrop in Cyprus that is entirely composed of sheeted dikes — one inside another. Such a sheeted dike complex is a common feature of the oceanic crust. Cyprus is one of the best locations in the world where rocks that once formed the oceanic crust are nicely exposed on the surface. Dikes are composed of basalt and diabase. Pillow lava forms underwater. The outer crust of the lava is quenched in contact with cold seawater. The interior still fills with molten material to form a pillow-like morphology. Fresh seafloor is covered with such pillows. This outcrop of pillow basalt is in La Palma. It formed when the island was still only a seamount beneath the waves. It is exposed because of uplift and deep erosional scar known as the Caldera de Taburiente. Igneous rocks that solidified on the surface often form lava flows. An edge of a lava flow in La Palma that looks like a huge pile of rocks. Sometimes lava flows have a smooth continuous surface. 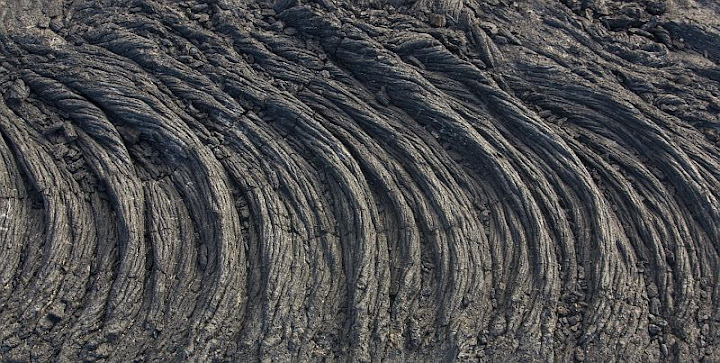 Such lava is called pahoehoe. Pyroclastic density current is the most deadly expression of volcanism. These rocks in Tenerife were deposited by a fiery cloud of ash, rocks, and gas that cascaded down the flanks of a volcano and incinerated everything in its path. Width of view is 0.8 meters. Sequence of pyroclastic rocks in Tenerife. Pumice layer is a product of violent plinian eruption farther away. Scoriaceous mafic dark-colored lapilli were ejected from nearby vents (Strombolian eruptions). Width of view is 12 meters. Large pyroclastic rocks (>64 mm) are known as bombs and blocks. Volcanic bomb resting on smaller lapilli-sized pyroclasts on the crest of Cumbre Vieja in La Palma. Width of sample is 15 cm (longer dimension). Igneous rocks are an important sources of many metals and diamonds and they make an excellent ornamental and building stone. Felsic coarse-grained pegmatites often contain interesting minerals which contain lots of relatively rare chemical elements. Tin, fluorine, tungsten, zinc, thorium, lithium, beryllium, etc. may be extracted from felsic pegmatites. Ultramafic igneous rocks may be rich in chromium, titanium, iron, vanadium, and nickel5. Magmatic hydrothermal fluids can carry substantial amount of metals like copper and gold which can be transported away from their source rocks and deposited within other rock types. Gold in quartz veins comes from magma. It is associated with chlorine which makes it possible to dissolve gold in water and carry it away from its source. 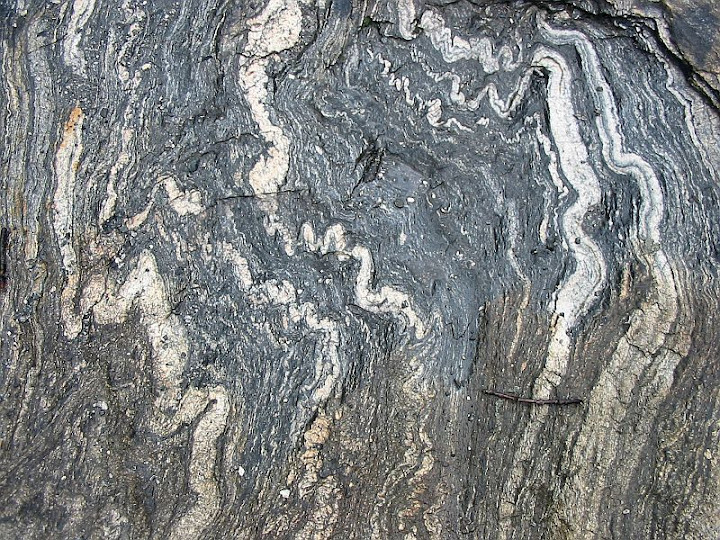 Reaction between magmatic fluids and granitic rocks results in greisens which can carry substantial amount of chemical elements like tin and fluorine. Reactions between magmatic fluids and carbonate rocks give rise to many interesting calc-silicate minerals. These rocks are known as skarns and they also frequently contain valuable metal-bearing minerals. Igneous rock diabase is a popular tombstone material. Width of sample is 25 cm. Chromite crystals picked out of a chromite concentrate from the Rustenburg mine, Western Bushveld, South Africa. Width of view is 5 mm. 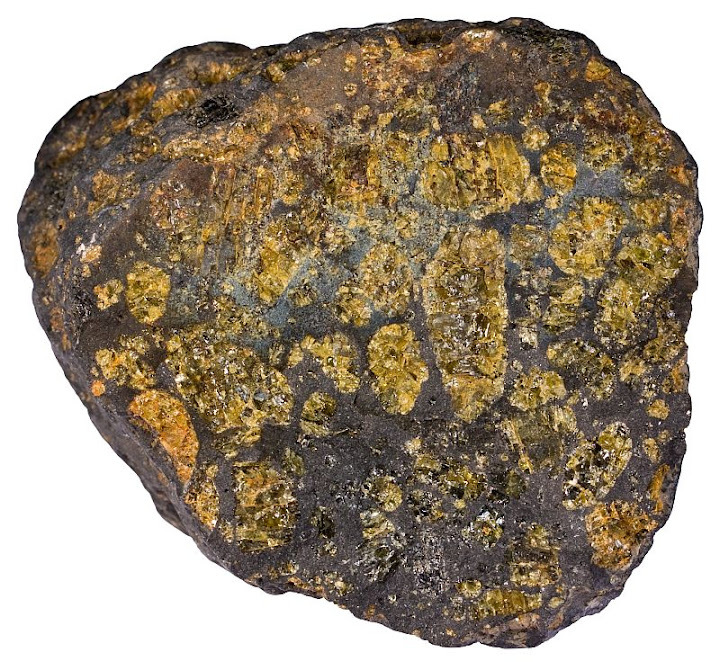 Kimberlite is a rare, but economically very important igneous rock because it contains diamonds. 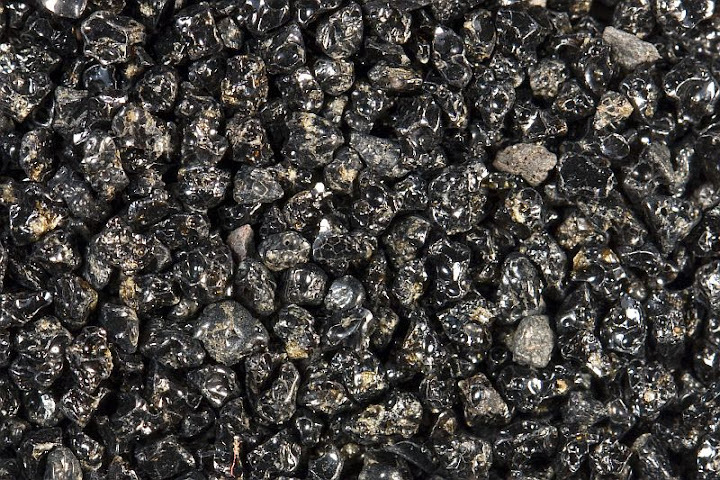 Kimberlite fills pipe-like structures (diatremes) in the crust. These structures were created by violent gas-charged eruptions. Small and easily erodable tuff rings form as a result of this, but most of the kimberlitic magma never sees daylight. We have to dig deep to get the diamonds. The sample is from Kimberley (“blue ground”), South Africa. Width of sample is 11 cm. 1. Raymond, Loren A. (2007). Igneous rocks. In: McGraw Hill Encyclopedia of Science & Technology , 10th Edition. McGraw-Hill. Volume 9. 14-20. 2. Le Maitre, R. W. (2005). Igneous Rocks: A Classification and Glossary of Terms: Recommendations of the International Union of Geological Sciences Subcommission on the Systematics of Igneous Rocks , 2nd Edition. Cambridge University Press. 4. Nesse, William D. (2011). Introduction to Mineralogy , 2nd Edition. Oxford University Press. 5. Robb, L. (2005). Introduction to Ore-Forming Processes . Blackwell Science Ltd.